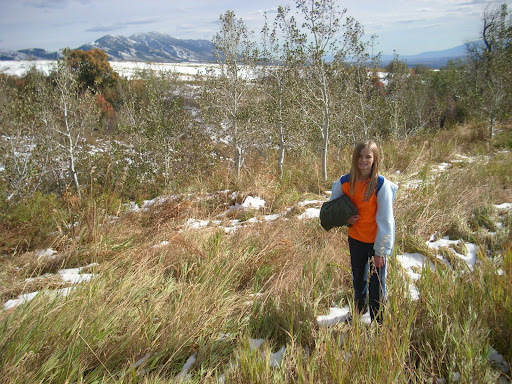 The older my kids get, the more I enjoy spending time with them in the great outdoors. 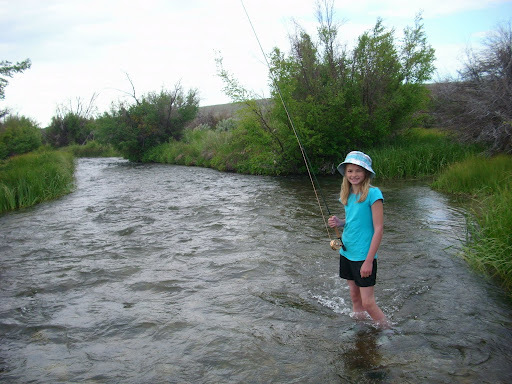 Earlier this year, I wrote in this blog about an awesome day my daughter, Nessy, and I spent fly-fishing on one of our favorite little creeks beneath a diamond shaped granite peak. This was definitely one of my favorite days fishing this past summer and a memory that will carry me through this upcoming winter. Nessy, my newest, best fishing buddy. When October 1st roles around each year, I get an itch to chase sharptails at the Royal MacNab, my favorite covert in the whole world. I’ve written about this spot in this blog numerous times. This year, October 1st came on Thursday, a work day for me, and I spent the day in the office working hard, but wishing I was hiking grassy hills and wooded draws in pursuit of one of my favorite game birds. Thursday night, I resolved that on Friday, if I could swing it, I would work only a half day and make it down to the Royal MacNab that afternoon. On the way to our destination, Nessy was the DJ and played some good tunes on my MP3 player. We sang, laughed, and talked as we spent some quality one on one time together. While we were on the road, little Eden called me on my cell phone in tears and asked, “Do I get to go hunting with you next year?” I tenderly answered, “No, you get to go with me next weekend! Is that okay with you?” “Okay, Daddy,” she replied. I better follow through with my promise! At the Royal MacNab, snow was still on the ground from a storm that passed through a few days earlier. This is very uncharacteristic for this covert at this time of year. However, the pallet of the scene before us was still beautiful with the yellows and oranges of the quakies and the reds and maroons of other desidous trees, now interspersed here and there with white patches of snow. Yet, the snow drained some of the usual warmth out of Fall’s colors. Unlike other hunts to this favorite locale, the birds were not in their regular haunts. Nessy and I saw a total of three sharptails. The first and second I missed ingloriously. I missed the third bird with my first shot, but then swung slightly ahead of the then quartering-away bird, tugged the trigger, and the shot swarm overtook it. My French Brittany, Sunny, made an awesome retrieve. Nessy was more excited about our first sharptail than I was. “All right, we got one! I guess I am not your bad luck charm after all,” Nessy exclaimed. “Nope, you are not. You’re a great hunting companion,” I laughingly agreed. 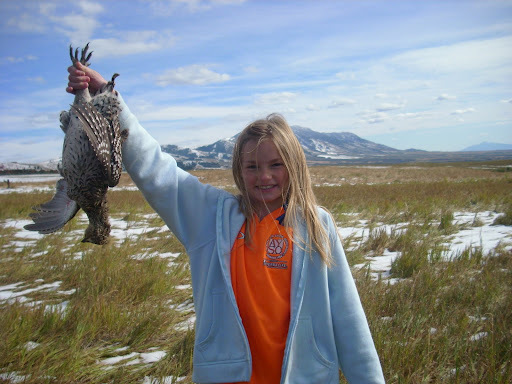 Nessy shows off our first bird together. 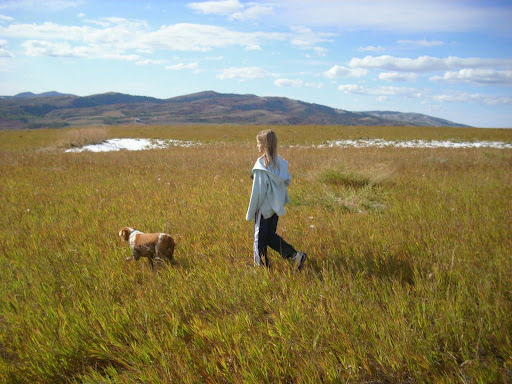 One of the most memorable things about this hunt was when Nessy, who witnessed little Sunny hunt her heart out for us, thoughtfully stated, “Being with Sunny Girl out here and seeing her hunt really helps you to appreciate what a great dog she is.” People who have never hunted with a dog cannot understand the depth of Nessy’s statement. I’m convinced that there is a bond between a hunter and his dog that cannot be replicated in any other setting. It was like a light turned on for Nessy as she watched Sunny doing what she was born to do. “I know. I love to hunt with Sunny too. She is one of my best friends.” I replied. I’m so glad that Nessy could catch a glimpse of what drives me to chase birds with birddogs. Watching Sunny, Nessy gained an appreciation for what a birddog does and is. If we don’t show them, they won’t ever know! Try as we may, we did not find any other birds that day. However, in retrospect, I found exactly what I was looking for: Quality time in nature with Nessy and Sunny Girl. I’ve said it before, and it bears repeating: The birds are just the bonus. The older I get, the more I understand that hunting is really about creating good memories. Who better to share these with than our kids? With soaked feet, Nessy was a really good sport. She did not complain even once while we hunted up some memories. Previous Post Huge Kudos to Scolopax!! Next Post >The Quiet Dog! Wish I'd been there with you guys!